Today I wanted to talk about Barbie. We all grew up with one. Love her or hate her, but the childhood staple isn't going anywhere. 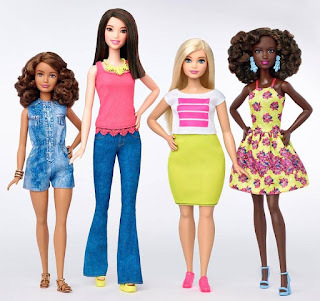 I don't know if you've heard or not, but Barbie is now going to be offered in a range of different sizes (tall, petite and curvy)- this also includes different hair styles and eye colors. Alright, but why is a 20 year old talking about Barbies? I'll tell you why. 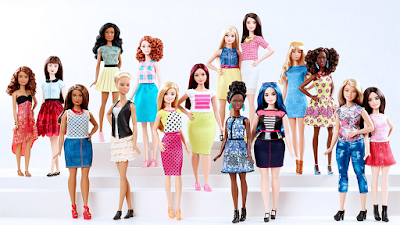 Children all around the world play with Barbies and the fact that there are more options than ever, that are all beautiful in their own way is remarkable. This teaches children that beauty is more than just blonde hair and blue eyes. Playing and learning, getting used to these ideas when we're younger, help shape our values for a lifetime. I'm a lover for body positivity, and while we can all agree that this move is long overdue, it's definitely a step in the right direction. One last thing, watch this to see what young girls think of the change. It makes me happy to see these young girls happy, and at the end of the day that's what matters. What do you think of Mattel's new Barbies?